Last year the Blockpass team attended events around the world, showcasing the Blockpass Mobile App and discussing how Blockpass can change the face of identity verification and how we comply with global regulations. Members of the team attended a total of 56 events in 18 different countries in 3 different continents. It was a busy and productive year with a number of partnerships, integrations and developments coming out of talks, connections and meetings held at these events, with more to be announced in the future. This year, in addition to continuing its presence around the world, Blockpass will also be running its own series of events. The global B4B Conference series will be held in March and November, and the Meet Up series will take place throughout the year. The Meet Up Series, which will take place twice monthly with one event per month in London and one per month in Hong Kong, will focus on key issues and developments in the blockchain and regulatory ecosystems, with a particular focus on security tokens and compliance. During the free Blockpass Meet Up series, not only will members of the Blockpass team present and discuss important issues, but representatives from our esteemed STO and KYC partnerships will also attend to give expert insights and commentary. 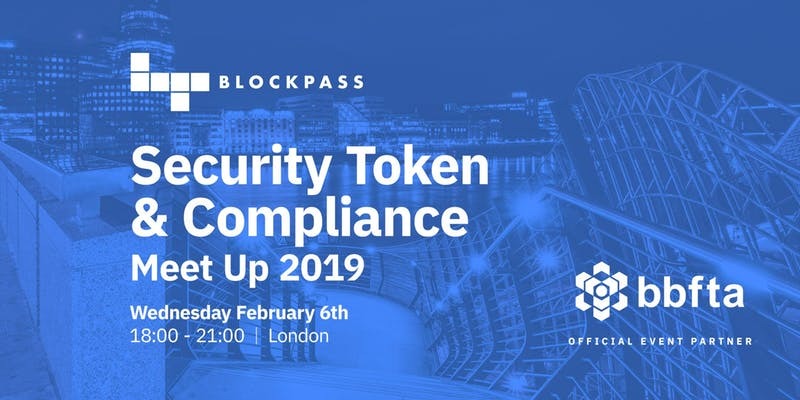 The first Blockpass Security Token and Compliance Meetups for 2019 will take place at the Cocoon Network in London on the 6th of February from 6pm to 9pm, where Blockpass’ CEO Adam Vaziri and CMO Hans Lombardo will present around STO platform functionality, evolving from an ICO platform and how Blockpass is bringing compliance to the blockchain space and beyond. This will be followed in Hong Kong later in February with the same focus. For more details on the event and to find details on future meetups, keep an eye on our newsletter, social media, and our Eventbright and MeetUp pages. Register now!